If you have been involved in an auto accident, you may be suffering terrible pain right now -- or you might be injured without any signs of discomfort whatsoever. That's because the effects of an accident-related musculoskeletal injury may not make themselves known for months following the event. During that time, internal scarring and other serious complications may increase in severity. By the time you experience pain, your physical issues could be far worse than they might have been if you had sought immediate care. If you do have symptoms, you know you need help, but you might not realize that non-surgical, drug-free relief is available. That is why our car accident chiropractor, Dr. Scott Duca, wants you to know that Back on Track Chiropractic provides accurate diagnoses and safe, effective natural treatment for auto accident injuries. Whiplash - This agonizing problem, named after the lash of a whip because of the action of the cervical spine in an impact, throws your skull forward and backward again hard enough to dislocate vertebrae or damage vertebral discs in your neck, while also straining the muscles and connective tissues. Whiplash can cause headaches, arm pain/tingling/numbness, nausea, dizziness, vision problems, and of course neck pain and stiffness. Lower lumbar injuries - The lower part of your spine can sustain the same kind of damage in an auto accident as the cervical region, especially if your safety harness causes your trunk to twist unnaturally. Herniated lumbar discs can cause sciatica, giving you pain, tingling, muscle weakness or loss of sensation down one or both legs. 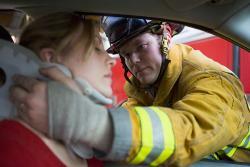 Shoulder pain - Shoulder pain might not be caused by direct injury to the shoulder in an auto accident. Instead, compression of thoracic nerve roots in the middle of your back can cause a problem called thoracic outlet syndrome, creating pain in your hand, shoulder or arm. Our Birmingham chiropractor urges anyone involved in an auto accident to get an immediate spinal screening so any lurking problems can be detected and corrected. If you are clearly experiencing whiplash, sciatica or other discomfort, Dr. Duca will pinpoint the problem and initiate treatment right away. Chiropractic adjustments can realign dislocated spinal components, shifting discs away from the sensitive nerve roots they're pressing against. This restores correct nerve function, allowing for natural pain relief and proper healing. Massage therapy and physical therapy may also be prescribed. Massage can relieve soft tissue pain and enhance the healing process, while corrective exercises help prevent internal scarring, helping you get your full strength and range of motion back. Contact our car accident chiropractor today to get the help you need! You can call our Birmingham office at 205-623-5782!